BEACON FALLS — Volleyball and charity go hand-in-hand for Emily Laput. Laput, a 14-year-old freshman at Woodland Regional High School and a volleyball player, is organizing “Spike for a Cure,” a charity volleyball game set for April. The money raised from the game will go toward Seymour Pink Inc., a non-profit organization that raises money for breast cancer research and assists breast cancer victims and their families. 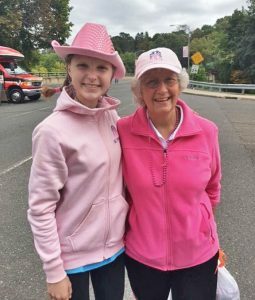 Laput has been volunteering with Seymour Pink since 2017, when she was a student at Long River Middle School. She said she would often pass the organization’s office in Seymour while going to the grocery store, so she stopped in one day to see what the organization was all about. Laput has helped the organization with its fundraisers over the past couple of years but wanted to step up to do more. So, last year, Laput hosted the first Spike for a Cure at Long River Middle School with teams of teachers and students competing. The event was so popular that Laput raised over $900, three times her original goal. This year, Laput decided to open the event up to the whole community. Spike for a Cure will take place on April 6 starting at 8:30 a.m. at the Connecticut Sports Center, 21 South Bradley Road, Woodbridge. Teams of six to 10 people can sign up in one of four categories: teenagers, young adults, adults or multi-aged players. Registration fees are $100 per team through Feb. 28 and $120 per team after March 1. Registration ends on March 15. Interested teams can sign up online at www.seymourpink.com/event/spike-for-a-cure-2019. Laput hopes to raise at least $1,000 for Seymour Pink at the event. Laput said she decided to make Spike for a Cure a community event, rather than just a school event, after seeing how many teachers took part in it last year. “Volleyball is sport that anyone can play. It’s more of a social sport,” Laput said. Hosting a larger event comes with new challenges. “It is more difficult because, when it is on a smaller scale at a school, everything you need is right where you are. I had to find volleyball nets and referees. I had to research best places and contact people I had never met before,” Laput said. Though challenging, Laput sees organizing the larger event as a good way to prepare for her future, while helping out a good cause. “I want to become an event planner when I grow up, so this is great practice,” Laput said.